Hello, my name is Sonny Koo and I spent the best part of a year living the life of a property agent. Honestly, my personality type meant that I wasn’t too good at it. One of the things that caught my attention during my “stint” as an agent was the lack of the “exploitation” of social media by property agents to advertise their listings. For the agents that did use social media, a lot of time was being wasted by the repetitive need to log-on and to list each property individually for each website. My background as an IT specialist made me search for a much more effective method to manage the listing and updating of properties under my portfolio. I am confident that it will bring real benefit to you as a successful real estate professional/agent. Instead of wasting your precious time having to individually list your properties on each site one by one, you only need to make a single entry on http://my.ipushproperty.com (website) and it will automatically post all your listings on almost every major social media website. This service is FREE and there are no catches whatsoever. All information you provide is secure and we strictly do not share your details with others. Do you Need this ?? 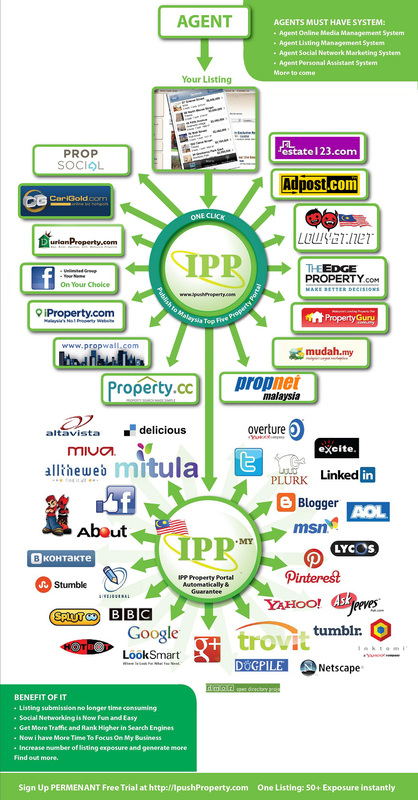 With combination of Free and Premium tools, I am confident that ipushproperty.com will bring real benefit to you. Instead of wasting your precious time on repetitive work you can focus on other more productive aspects of being successful in life. ipushproperty.com is the MOST CONVENIENT, MOST ACCURATE and a TIME SAVING way to list your properties. And it costs just RM30* a month or RM1* a day. Just register on our website and follow our simple guide to get started. If you have questions, there is a list of FAQs on our website or contact me on (+6012-337-3334). This developer ISNT joking about customer service. If you are about to buy it, close your eyes and invest its. That is nothing compare to the quality of this program and support is the best. Dearest Team of I Push Property, Thank you – Thank You – Thank You!!!! Yout support is so great!!!! And your passion helping others to get it is huge!!! I appreciate your wonderful support ! Hi, guys just want to say thanks for such awesome software and outstanding support! I love that I can whatapps, open the ticket and you even provide onsite support free of charge when they are needed! Makes it all so easy and inspiring! I can focus on viewing and marketing for my estate career, instead of hiring Personal assistant…. Best bang of the bucks Thanks !! You guys have thought of everything with this software. I am really enjoying it, the documentation is simple and support is excellence. Very well done. I bought this software and i would like to recommend it to every Property Agent interested in building a strong Online Media Branding without hiring personal assistant. It is very convenient and the customer service is very reactive. I will say it in French “Bravo” for this work! This is an incredible application. The more I work with it, the more I see how easy it is to advertise and branding myself !!! Your support is also outstanding. My two small inquiries, you got back to me immediately. I will use this application for many more year in the future. Keep up the good work. And THANKS!!! !